I had what my Mom would call an “outing with the ladies” this past Friday. Brandy & Cinnamon came out to Oak Park to play with me. We got to check out some places that amazingly I hadn’t yet made it to, the Buzz Cafe for lunch, a fun bead shop Bead in Hand, and the new Brown Elephant thrift store. 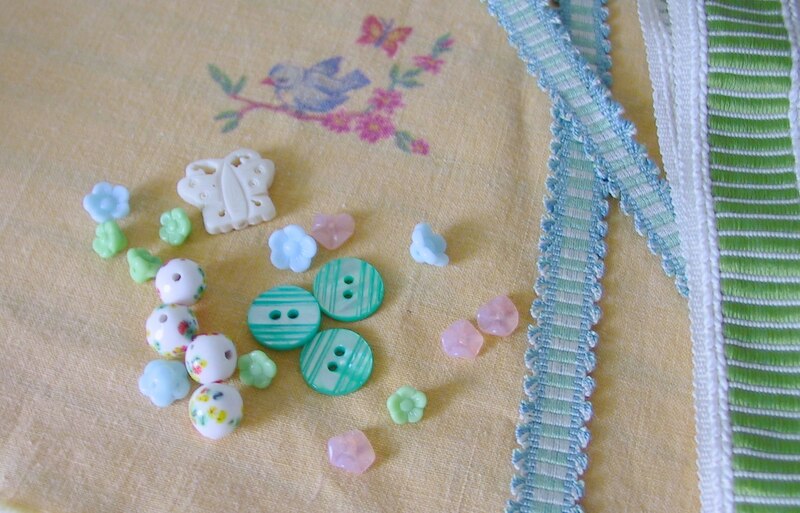 I got some lovely beads and buttons at the bead shop and found some great trim & vintage greeting cards at the Brown Elephant. Oh and some pretty lustreware cups and saucers. Then we checked out OP’s cool new gift shop Flybird and then back to my place for some hanging out in the craft room. It was so much fun to spend the day with a couple of crafty gals. They both know all about having a small business, fabric, sewing, etc. I learned so much! Cinnamon even pointed out to me that I was using the wrong foot for zippers! Now that I have the actual zipper foot installed look out! nothing like a girls club meeting to brighten up things. Thanks for the lovely day, Hillary! It was mucho funo. Yes, thank YOU Hillary for showing us your lovely home and one of the best organized craft rooms I’ve seen. Your inspiration board over your sewing machine was just fascinating! Can’t wait to see what comes of that zipper foot action.